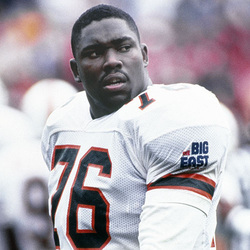 A consensus All-American and the first Hurricane to win the prestigious Lombardi Trophy, Warren Sapp was a man among men as he annihilated opposing quarterbacks in the early 1990s. Sapp was so dominant on the defensive line that he made the short list for the Heisman Trophy during his junior year, as opponents tried to formulate offensive schemes with futile hopes of containing #76. Known for his effervescent smile and larger-than-life personality, neither trait endeared him to Hurricane foes in 1994, when Sapp recorded 10.5 sacks and made forcing fumbles look easy. Along with All-America honors, Sapp was a unanimous Big East Defensive Player of the Year winner and earned Hurricane football's highest team honor, the Jack Harding MVP award. A first-round draft pick of the Tampa Bay Buccaneers in 1995, Sapp is one of the select few players to earn both an NCAA Championship football ring and a Super Bowl ring. Selected to seven NFL Pro Bowls and awarded the 1999 NFL Defensive Player of the Year award, Sapp has more than fulfilled the promise shown as a young big man from Plymouth, Florida when he arrived on the Coral Gables campus in 1991. Sapp finished his UM career with 176 tackles, 19.5 sacks, and many forced fumbles and pass deflections. Upcoming Hurricane opponents were not sorry to see Sapp leave early for the NFL. After nine years playing for the Bucs (1995-2003), Sapp spent 4 seasons as a member of the Oakland Raiders (2004-2007). He was named the NFL Defensive Player of the Year in 1999, a 7-time Pro Bowl selection and member a of the Super Bowl XXXVII Champions.